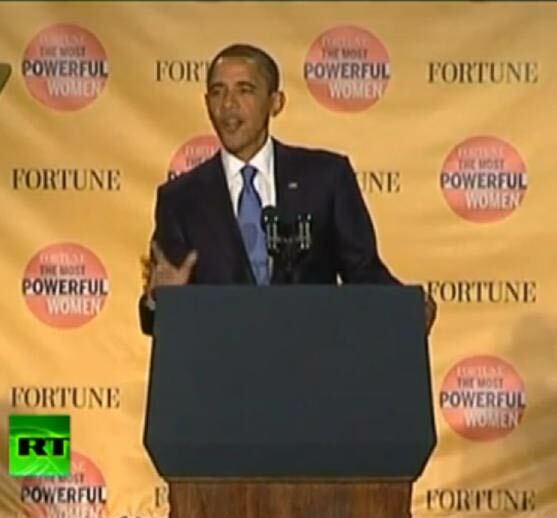 Midway into the delivery of a speech President Obama was giving to Fortune magazine's Most Powerful Women Summit on Tuesday, October 6, the presidential seal fell off the front of his podium. "Oh goodness," the president ad-libbed at the Washington event. "That's all right. All of you know who I am." He then ventured a guess that at least one member of the set-up team was "sweating bullets." Ed Driscoll at Pajama Media cried"Metaphor alert!" and summed up the punditry on this incident. "The trappings of the presidency are falling down around President Obama," says Dana Milbank at The Washington Post — literally, in this case. The seal was obviously "expressing its distaste with two years of compromise and failure to support progressive values," says Nitasha Tiku in New York. Even the media knows about signs and symbols. Whether they believe in them or not is another question. Liberal commentator Keith Olbermann at MSNBC said he would give $2 to the first Conservative who claimed it was a sign. Well, I’m not Conservative. But, I will claim the $2 if nobody else will. Seals don’t fall off podiums (or is it podia), especially presidential ones, every day. Someone was probably sweating bullets about the incident. Not the President. But, he will be sweating the mid-term elections as the Democrats lose big. His Presidency is clearly in jeopardy and it is more than doubtful that he will be re-elected in 2012. Signs suggest he won’t see a second term. Hopefully, George W. Bush will not attempt a reprise. Other Signs of the Times.